The Great Green Wall initiative is a pan-African proposal to “green” the continent from west to east in order to battle desertification. It aims at tackling poverty and the degradation of soils in the Sahel-Saharan region, focusing on a strip of land of 15 km (9 mi) wide and 7,100 km (4,400 mi) long from Dakar to Djibouti. Populations in Sahelian Africa are among the poorest and most vulnerable to climatic variability and land degradation. They depend heavily on healthy ecosystems for rainfed agriculture, fisheries, and livestock management to sustain their livelihoods. These constitute the primary sectors of employment in the region and generate at least 40 percent of the gross domestic product (GDP) in most of the countries. Additionally, the ecosystem provides much needed livelihood products, such as fuelwood and bushmeat. Unfortunately, increasing population pressures on food, fodder, and fuelwood in a vulnerable environment have deteriorating impacts on natural resources, notably vegetation cover. Climate variability along with frequent droughts and poorly managed land and water resources have caused rivers and lakes to dry up and contribute to increased soil erosion. The vision of a great green wall to combat ecological degradation was conceived in 2005 by the former President of the Federal Republic of Nigeria, Chief Olusegun Obasanjo, and the idea was strongly supported by President Abdoulaye Wade of Senegal. 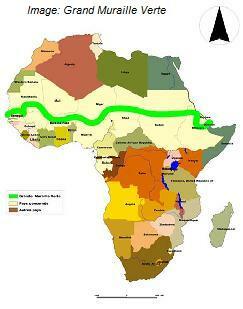 The vision evolved into an integrated ecosystem management approach in January 2007, when the African Union adopted declaration 137 VIII, approving the “Decision on the Implementation of the Green Wall for the Sahara Initiative”. In June 2010, Burkina Faso, Chad, Djibouti, Eritrea, Ethiopia, Mali, Mauritania, Niger, Nigeria, Senegal and Sudan signed a convention in Ndjamena, Chad, to create the Great Green Wall (GGW) Agency and nominate a secretary to further develop the initiative. The participating countries hope that by linking national-level efforts across borders, they will tackle policy, investment, and institutional barriers that exacerbate the effects of climate change and variability, leading to desertification and deterioration of the environment and natural resources and the risk of conflicts between communities. International Colloquiums are held to discuss possible barriers as well as share available knowledge on the vegetal species, systems of development, and GGW monitoring updates1. The GEF emulates the spirit of collaboration by allowing participating GGW countries to prioritize which projects they want to implement, in conjunction with GEF agencies and their partners. They may “develop one or several projects in the context of this program and assign some or all of their financial allocations to the Great Green Wall”. 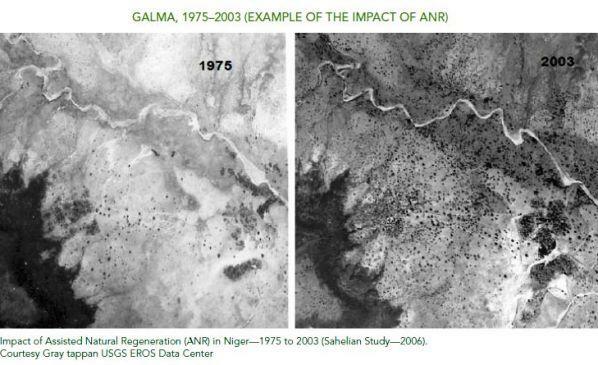 Progress is apparent especially in the Zinder region of Niger, where tree density has significantly improved since the mid-1980s. GEF CEO Monique Barbut attributes the success to working with farmers to find technical solutions, particularly long-term land and financial solutions, in order to save the trees. This form of natural regeneration benefits local communities and the global environment alike by increasing crop yield, improving soil fertility, reducing land erosion, improving fodder availability, diversifying income, cutting wood collection time for women, strengthening resilience to climate change, increasing biodiversity, and much more.